Anyhoo, let me tell you about these sandwiches, or should I say little bites of heaven. Yeah, people. They're that good. I am SO GLAD I stumbled across these little beauts. First of all, they're so easy to throw together. Ridiculously easy. Second, they elevate an otherwise boring lunchtime ham and cheese into something very dinner worthy. Third, everyone loves them! Me, my husband and my three year old all scarf these down like they're going out of style. I even made them for my daughters second birthday party! What makes these sliders so special is the combination of the sweet roll and the savory sauce on top. Don't skip the sauce. You'll be missing the star of the sandwich if you do. And DON'T skip the poppy seeds! Go out and buy a small thing of them before you make this even if you think you'll never use that many poppy seeds in your life, because I promise you, you'll be making these again. So, go on. Make them for a party. Make them for lunch. Make them for dinner. Just make them! 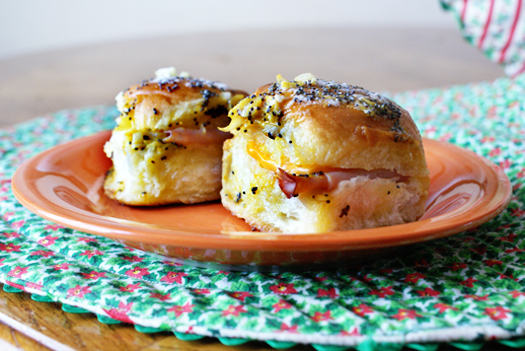 Place one slice of ham and one slice of cheese on each roll. (Fold the slices up to make them fit on the tiny buns.) Place the sandwiches on a cookie sheet with the sides of the sandwiches touching each other. In a bowl, whisk together the remaining ingredients to make the sauce. Pour the sauce over the tops of the sandwiches. Cover with foil and bake for 10 minutes. Remove the foil and cook for an additional 2 minutes. Serve warm. Make ahead and keep in the fridge until you're ready to bake them. I've also made these with turkey and swiss. Sub the meat and cheese with whatever you like! Source: Adapted from The Girl Who Ate Everything. Shared on Wicked Good Wednesdays at 365 Days of Baking.